In an age when nonprofit organizations are struggling harder than ever to have their messages heard, the value of branding and design has become increasingly essential to their survival. Today, a first-of-its-kind book, Designing for the Greater Good, was released to offer readers insights into great nonprofit branding campaigns in 24 inspiring case studies and hundreds of illustrated examples. ADG was among the firms whose outstanding campaigns were selected for inclusion in this prestigious collection. The book is based on authors Peleg Top and Jonathan Cleveland’s nearly 40 years of combined experience working with nonprofits and corporate communications departments across the country. The book features our 2008 YMCA Annual Report for Middle Tennessee. Our main objective for this piece was to re-enforce the YMCA of Middle Tennessee’s adventurous branding and vision—and do it in an effective and engaging way. The piece had to communicate financial findings, recognize donors, volunteers, and staff, and demonstrate the client’s emphasis on growth and community. 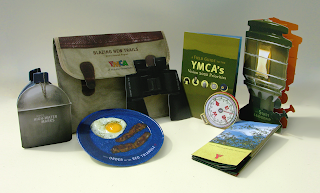 We built on a camping theme to help celebrate the new overnight cabins at the YMCA’s campground. Each piece was die cut into shapes like a knapsack folder, field guide, compass, lantern, canteen, pan, or map—all of which fit into a folder that looks like a back pack. 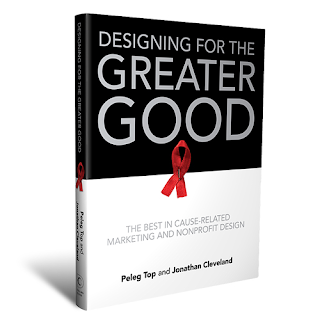 Designing for the Greater Good (Harper Design, an imprint of Harper Collins) is available to the public starting January 26, 2010.